When The Caravan Club of Great Britain and Ireland (today known as the Caravan and Motorhome Club) was formed in 1907, it aimed to bring together the UK’s growing number of horse-drawn leisure caravan enthusiasts. 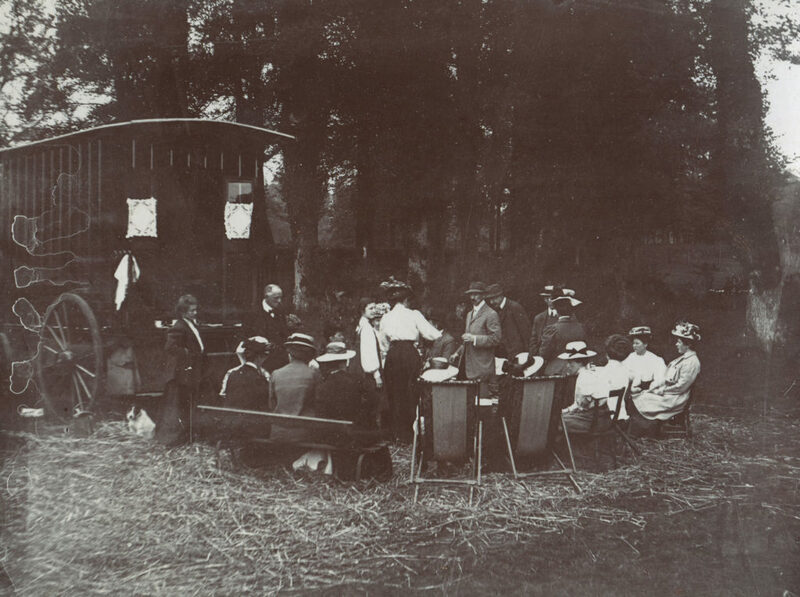 In great contrast to the many exclusively male members’ clubs of the Edwardian era, The Caravan Club actively welcomed women who formed around a third of the clubs membership during its formative years. Here we meet some of these pioneering women listed in the Club’s registers. 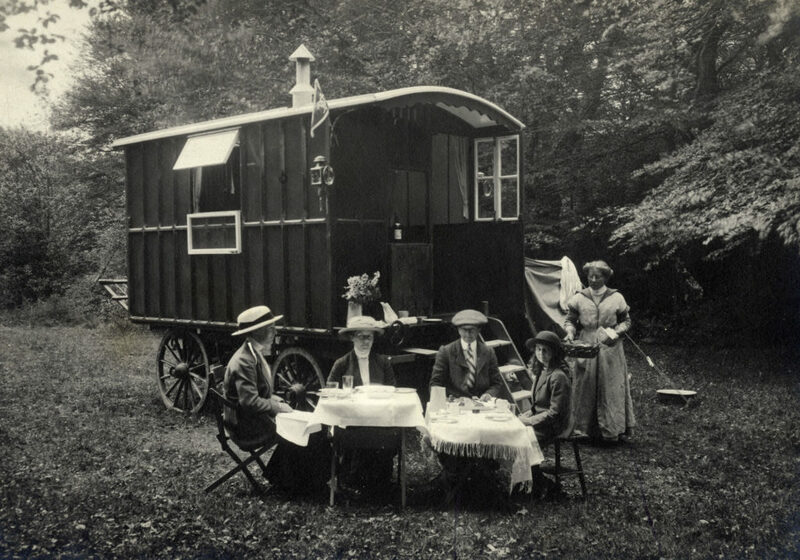 In the early twentieth century the craze for the idyllic pursuit of the horse-drawn caravan holiday was sweeping across the leisured and professional classes of Britain. For many who lived in bustling and industrialised areas, the draw of a relaxing tour through coast and countryside was great. The health benefits of enjoying fresh air was greatly promoted by the Victorians and Edwardians. For many, as it does today, the caravan provided a solution for the perfect escape. Among the group of eleven founders of the organisation was Mrs Edith Dawson (née Robinson) who alongside her husband (and fellow founding Club member) Nelson Dawson were central figures in the Arts & Crafts movement. The couple were particularly well known for enamelled jewellery which, true to the ethos of Arts & Crafts, revived historic and often forgotten skills and techniques to produce their artworks. The similarities in the Dawson’s approach to art and their interest in caravanning are striking, with both movements promoting a return to a simple approach as a direct reaction to increased industrialisation. Sadly nothing is documented of Mrs Dawson’s caravanning exploits, and her involvement with the Club appears to be short lived after disagreements which arose over the running of the newly formed organisation. However, she can certainly be credited as the first female member of the Club. Harris Stone also wrote of one young unnamed lady member who travelled through England and Wales entirely alone with a donkey and cart. Partially paralysed and of a delicate constitution she was advised to spend more time in the open air, and took to the road in the hope that this would have benefits on her health. She wrote to Harris Stone often with tales of her independent travels, living as simply as she could and buying all her supplies from farms. Madge Paton with ‘The Tortoise’. 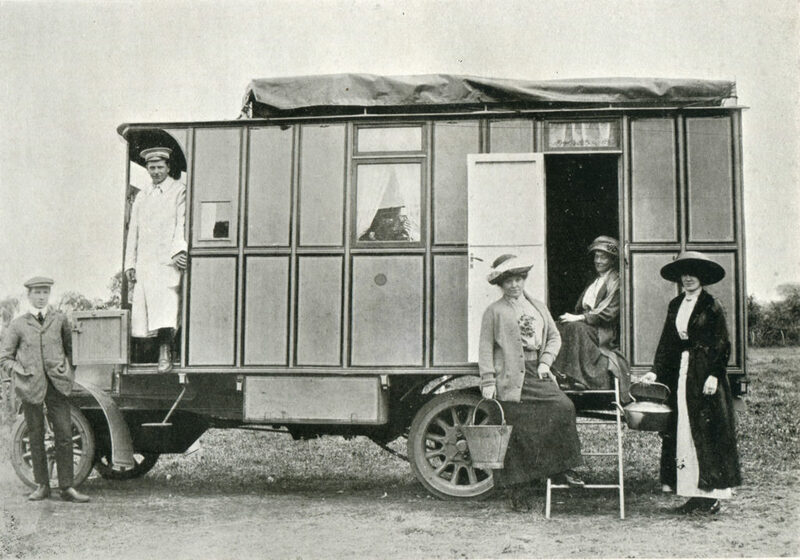 At the more luxurious end of the caravanning scale, a new breed of caravanner was emerging on British roads in the years before the First World War. The pioneer motor caravanners were a group who embraced new developments in automobile technology and travelled in bulky and often cumbersome ancestors of the motorhome. Mrs Madge Paton of Dundee was one such pioneer who combined caravanning with motoring. She toured the roads in her large motor caravan named The Tortoise, employing a coachman to do the driving. From its earliest days The Caravan Club attracted independent and adventurous women into its ranks. Artists, students, campaigners and Suffragettes were all among the women who enjoyed the freedom of the road.